CSU congratulates Dr Ronald Camplin, OAM, for his 70-year career in the radio industry. 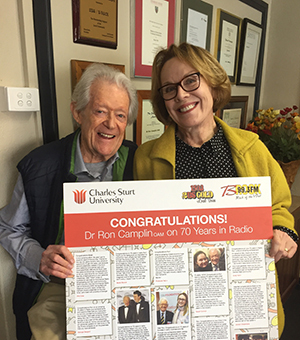 Charles Sturt University (CSU) congratulates Dr Ronald Camplin, OAM, for his 70-year career in the radio industry. Dr Camplin’s career took him from office boy at Radio 2CH in Sydney to owning Radio 2BS in Bathurst and radio stations elsewhere. Throughout his career Dr Camplin (pictured with his wife Stephanie) built a strong reputation for his significant love and knowledge of radio, and also his support for rural communities. This support was extended to CSU and its predecessor institution Mitchell College of Advanced Education through Dr Camplin’s mentorship of future generations of radio presenters. Over many years numerous CSU journalism and communication/radio students in the CSU School of Communication and Creative Industries in Bathurst have gained valuable work experience and professional development through work experience placements with Dr Camplin’s radio station 2BS. CSU Vice-Chancellor Professor Andrew Vann said the University was proud to recognise Dr Camplin’s achievements and support. “There are many graduates of Charles Sturt University who have benefited from Dr Camplin’s experience, wisdom, interest, support, and especially his enthusiasm and encouragement,” Professor Vann said. Director of CSU Advancement Ms Sarah Ansell said Mr Camplin has been a long-term supporter of the University and actively involved with the Charles Sturt University Foundation for almost 40 years. She noted that Dr Camplin was also a great supporter of the then-Mitchell College and was President of the Mitchell Foundation. “Ron and his wife Stephanie have made many substantial personal donations to Charles Sturt University over the years, as well as providing ongoing in-kind support through 2BS and BRock FM. 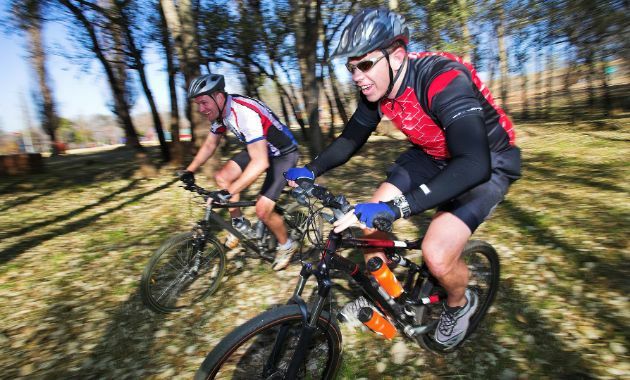 “Through his entrepreneurialism, energy, engagement and generosity Ron has positively touched the lives of countless individuals and created a roadmap for success that reaches far beyond his professional career,” Ms Ansell said. The acting manager of community radio 2MCE located at CSU in Bathurst Ms Michelle O’Connor said Dr Camplin thrived in an industry faced with many challenges, and congratulated him on reaching his 70-year career milestone. “Ron has remained committed to the value of radio as a communication medium,” Ms O’Connor said. “He is a champion for emerging talent and has provided opportunities for many young professionals who have gone onto to work in national and international media organisations. Ms O’Connor noted that Dr Camplin is loyal to local communities, which is reflected in his radio stations which continue to promote local content and support community events. CSU conferred an honorary Master of Arts (Communication) on Dr Camplin in 1993, and in 2003 conferred on him a Doctor of Arts (honoris causa). Photo: Dr Ron Camplin and his wife Stephanie at celebrations at radio 2BS in Bathurst marking his 70-year career in the radio industry.